It’s been a while now since my last Articles was on aired at MBL. However, this gap gave me a chance to visit the blogs of our valuable readers and fellows. On the other hand, it was extremely disappointing to see that many of them are reproducing the same content with minor modifications in it. Even the post on ‘Blogging tips’ consist of the same original content, decent grammar, add humor tips without any clear direction. 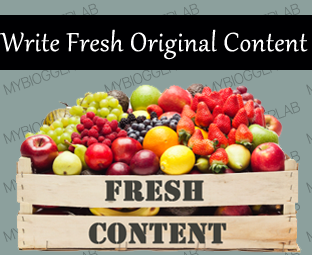 Everyone advises others to produce the original high quality content, but no one tells that, ‘where to get the original content from?’ This post is an in-depth strategy that a person can effortlessly follow whenever he wants to harvest a brilliant piece of content. 1- What do you want to deliver? Whenever a person think’s of writing on a topic, his first step is to Google that topic and then surf from one blog to another finding out that what other people are writing about it. This practice can affect the originality of content as a person’s mind would be pre-occupied with other people’s work. Moreover, as a consequence his creativity would be limited by his approach. So, next time whenever a person come up with a new post idea then he should make himself clear about what do he want to deliver from his post? (I personally use the ‘Mind Map’ technique for brainstorming and then arrange the random points in a proper order). A person can always note down the key headings so he can easily formulate a splendid article. You are clear about your target. The next step is to look for the proper and authentic information for your article. If a person is writing about any product, widget, software or whatever it is; always try to get the information from the official or developer’s website. If a person is writing on entrepreneurship topics, business skills, or engineering topics, but he didn’t find any relevant website to collect desire information then in this situation he can search for the relevant books and e-books. Sign up to the latest newsletters, research papers and e-books if you want to provide the quality information to your readers. YouTube is not the source of entertainment only. Use it to gather the content for your article. It serves as an excellent help when a person is writing apps review or tutorials. Add YouTube videos to your articles, if necessary. If a person do not want to add more than two videos, then watch the videos yourself and express the entire stuff that a person want to share. As a writer, a person should always try to improve writing skills. Read successful writers and observe what techniques they used. A person may need to join any course that helps increase his vocabulary or teaches writing skills. Observe the advertisement campaigns and the catchy lines in them. Ask your friends to give their honest opinion about your writing pieces and try to overcome your weak points. This may appear obvious, but it is extremely essential. Usually a blog has many categories. For example, at MBL Blog we have blogging tips, blogger tricks, money making, blogging widgets, and so on etc. Blogging widgets and Blogger Tricks are purely tutorial based categories. If a person wants to tell his reader about how to install a particular widget, then it should be precisely straightforward in words (use minimum words) as all they want is to follow, “Go to -> this-> that-> then-> copy -> paste->done”. If a person is writing a software review, enlisting the features, license type, size, system requirements and the download link would be enough, but this technique does not work for blogging tips and ethics. Whenever a person asks them to do anything, he is supposed to tell them why should they follow your advice? Similarly, any argument based topic should be treated differently. A person should be able to understand that different topics demand different writing techniques and make sure that they are correct ones. High quality content is a reliable one. Digging out the authentic information will be your biggest power as it ensures that the content is reliable enough. Do not convey fake rumors through your blog. Even if it is about any product that is yet to come on the market, then present your expectations on a logical basis. Else, quote down the sources that ‘We have come to know about the release through XYZ Company’. I have witness many newbies attaching so many titles to their names as if they have been in the field for so long, and they have a lot of knowledge and experience. This is wrong! Portray what you are and Avoid self-entitlement! Remember, Honesty is the best policy in all cases. The answer is modest, and the resources vary from one blog to another. If a guy blog about graphic designing, then he should have the latest designing software installed in his system. If he writes on blogger and WordPress customization techniques, then it is essential to experience both the platforms. Similarly, you can always take new courses that add up to your knowledge and as a result improves the quality of your work. By interaction here, I do not mean networking. Meet people and exchange the views about your niche because it would help you think out of the box. Do chat with your co-workers, fellow writers, bloggers or developers and ask them what techniques they use. Ask them what their course of action when given a task is and see if you can learn anything valuable. Enough advices and tips for today? Yes, I know some people may object that it takes a lot of time to read books and some may argue. Well, there are many other options, but this post was meant to tell everyone about some principles that have always helped me (at least). Do you have any other golden tip? Do not forget to share your personal experience. Positive criticism is always highly appreciated. Stay Focused! Stay blessed!